Beginning with transfer from Your Hotel to the Pier so we start the Ang Thong National Marine Park Adventure Tour. About 08:30 am all tour guests check in with our guides to receive snorkeling equipment and can enjoy our light breakfast with croissants and jams as well as Tea and coffee. We will be departing from the Pier Around 09:00 am with high speedboat to move toward Angthong National Marine Park. At 10:00 am we arrive, after a ride of about 1 hour, to the Natural Park of Ang Thong. The crew will take you during the morning on a snorkeling adventure, then afterwards we will enjoy a walk up to the inland to see the beauty of the Emerald lake with all its surrounding spectacular views. 12:00 We arrive at Wao Island for our stop, all guests will enjoy delicious buffet lunch at the restaurant here on Woa Ta Lab island (Marine Park Headquarters). 13:00 pm after lunch we will endure kayaking around the island ( we will explore all his magnificent places and limestone caves by using the sea canoe or kayaks ), hiking time up to the top viewpoints of Woa Ta Lab, relax time on the fantstic beach. From 15:00 pm we will start returning trip toward Koh Phangan Island, after reaching the Pier around 16:00 pm we will transfer you back to your hotel. 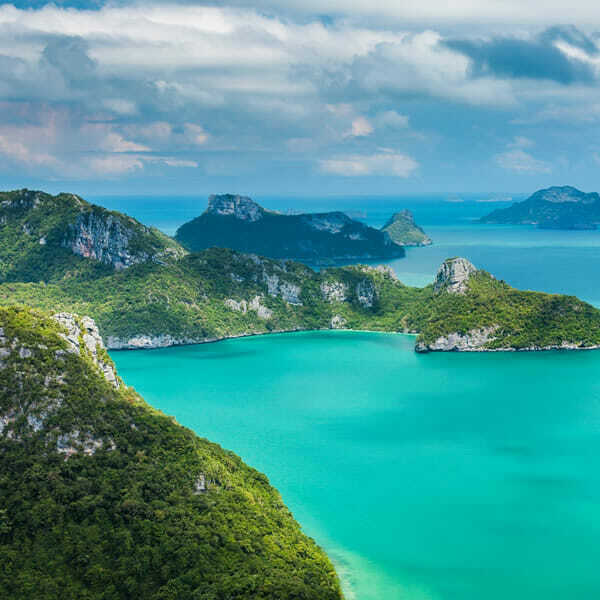 Angthong National Marine Park is a fascinating archipelago of 42 tropical islands in Southern Thailand. The name translates as ‘golden bowl’ and occupies almost 250 sq km and includes 50 sq km of limestone islands and cliffs which rise from the sea as dramatic and bizarre rock formations. 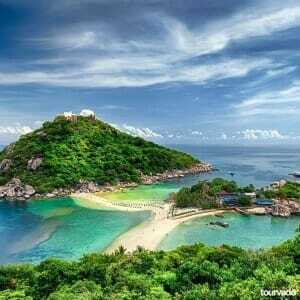 A tour to this beautiful park can be arranged from Koh Phang which is North West and only 45 minutes away by speedboat. Angthong national marine park tour is usually a well-organized day-trip which departs from Koh Phangan Island daily. The park features four distinct types of forest, all teeming with wildlife. Some of the creatures to be spotted here are langurs (long-tailed monkeys), little herons, hair-nosed otters, pacific reef egrets, white-bellied sea eagles, iguanas and pythons. In the surrounding sea many colorful fishes can be seen, offering some decent snorkeling and diving sights. 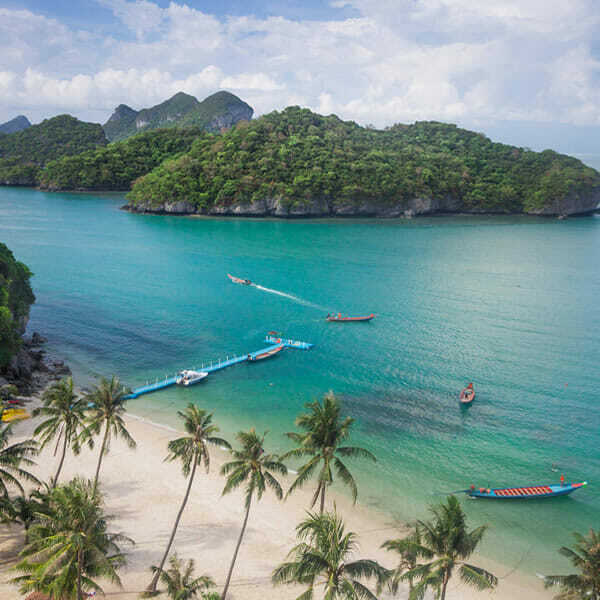 Amazing highlights include a stunning beach and an inland saltwater lagoon called Emerald Lake (Thale Nai) so beautiful and pleasing to the sight. A popular climb up pathways and a wooden staircase takes you to the peak of a nearby mountain where you get the full view of this glittering sea-green body of water. 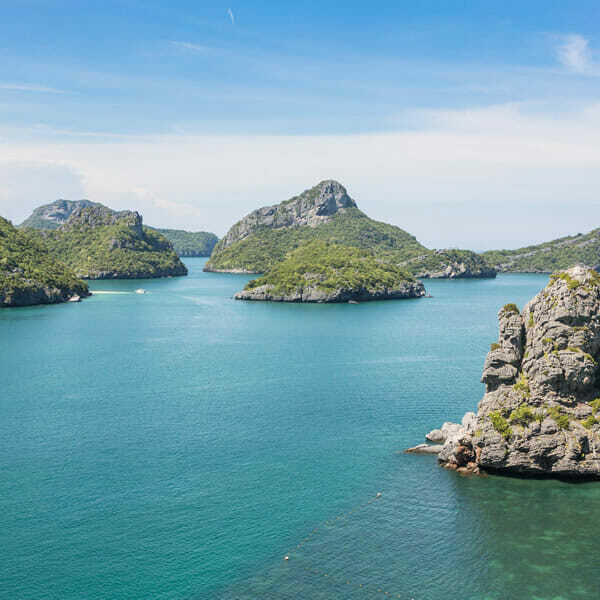 Koh Sam Sao (Tripod Island) features a coral reef, a large and dramatic rock arch and some great hiking grounds. 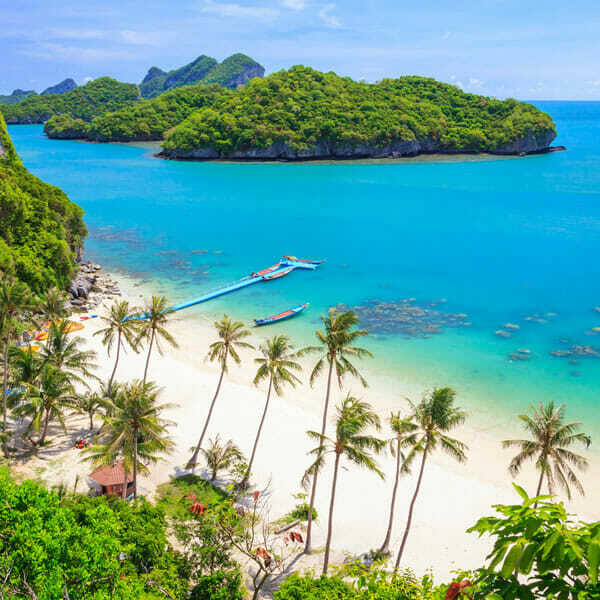 Sailing liveaboard cruise trips and speedboat charters are usually organized and other tours stop at a few different locations and combine a day of hiking, sightseeing, kayaking and lounging on the beaches. Some of the hikes require a good level of fitness, so be sure to check with your guide about the degree of difficulty before setting off. 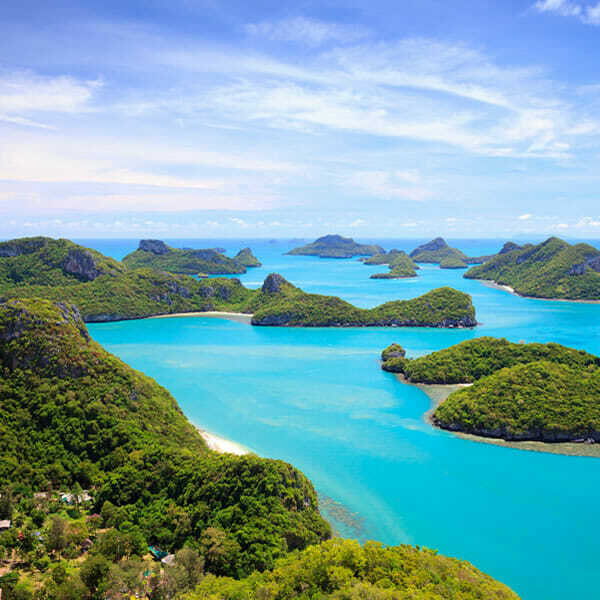 All in all, Angthong National Marine Park will blow you off your feet with it wonderful highlights.